In More Than Paper's thirteen years of being in business and personalizing over 100,000 products, we have noticed some routine grammar and spelling errors. 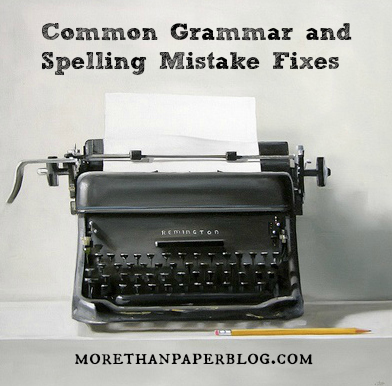 We are here to help by identifying those common errors and sharing their fixes! Whether it will help you place your orders, write letters or your blog, or help you at work, these tips are sure to help! #1: Where does the apostrophe go? Does it need an apostrophe? There are two primary uses for a single apostrophe. An apostrophe is used when words are contracted and it goes in place of the letters that have been removed. Example: "You are right" becomes "you’re right." A second use for a single apostrophe is to show possession in the form of apostrophe and s. For example, "This is Timmy's ball" means the ball belongs to Timmy. Another rule is that you use the apostrophe and s after the second name only if two people possess the same item. Example: Helen and George’s poodle is adorable. One of the most common mistakes we see at morethanpaper.com is the incorrect usage of apostrophe and s with a family name. You DO NOT use an apostrophe to pluralize a last name. For example, you refer to all the members of the Smith family as "The Smiths," NOT as "The Smith’s." Read more about rules of the apostrophe here. #2: There, their or they’re! "There" is used in two ways. It can specify a place or can be used to start a sentence. "Their" is used as a possessive form of “they.” "They're" is short for "they are." Dependable, independent, recommend, responsible, occasion and separate are all correct spellings of these words. #4: We love a good infographic and found this one from Copy Blogger to be very helpful. Take a peek! So what do you think? Are you going to make these errors again? We bet not!